A note on Airport Security at Mumbai Airport. We experienced something wonderful and simple we have never experienced before. I hate taking my computer, ipad, cellphone out and putting them in a tub that goes through the x-ray machine. You are separated from them as you go through and are afraid someone might walk off with them. At the Mumbai airport the tubs have a clear plastic top and a lock. You put your valuables in them, lock the tub and take the key. When you complete the pat down (the physically wand and pat down everyone at all Indian airports) you retrieve your locked tub, put the key in and retrieve your stuff. It is a great idea! 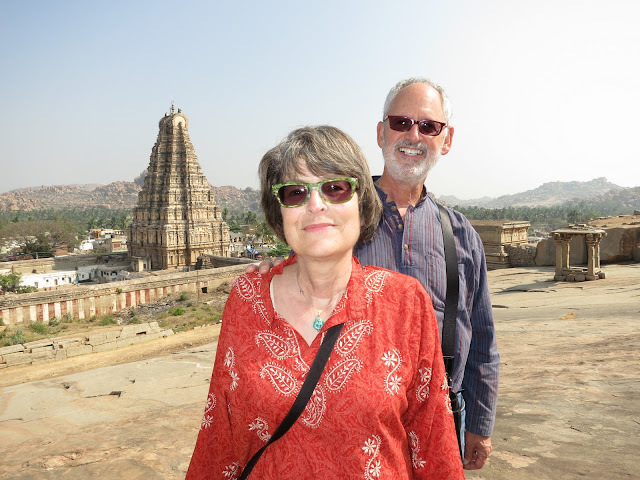 Today was about visiting Hampi. 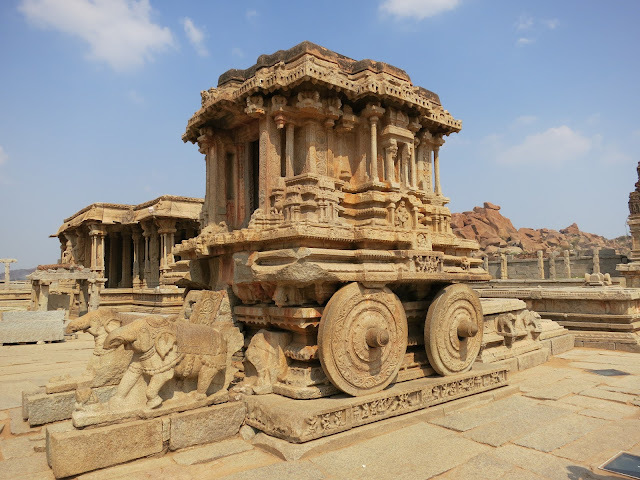 This is one of the most spectacular sites to visit in Southern India. 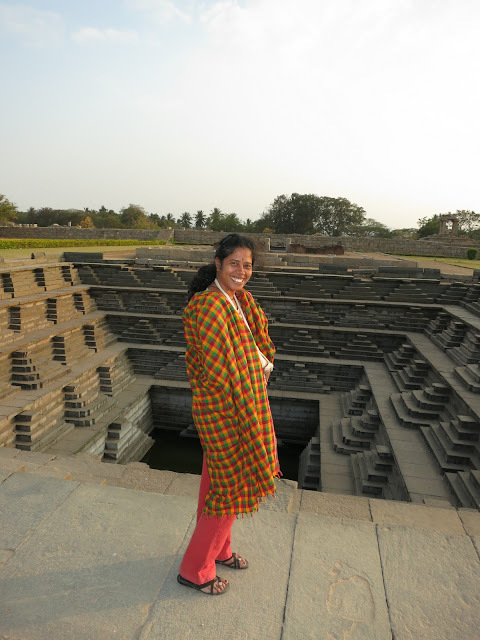 Once was the capital of a very rich Indian Empire, it is now ruins that are being restored. It is a World Heritage Site, and for good reason. 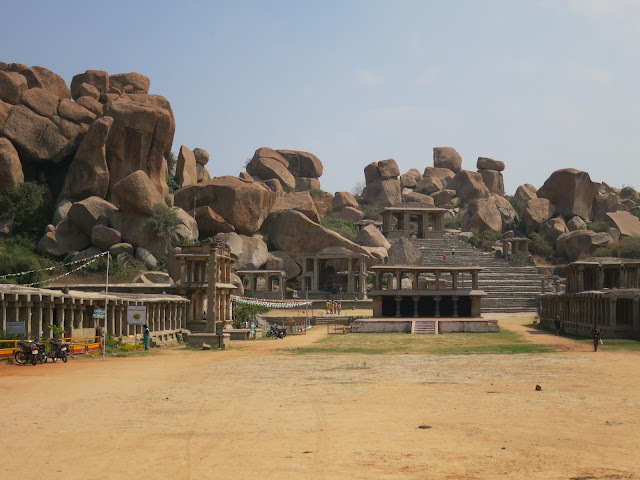 The region is covered with giant boulders, precariously balanced on hillsides overlooking the ruins. The area of the ruins is enormous. Untold temples were built here from stone. They remind you of the Roman Forum or Greek ruins or Angkor Watt. You walk or drive from palace to temple, to Elephant barns to water tanks. 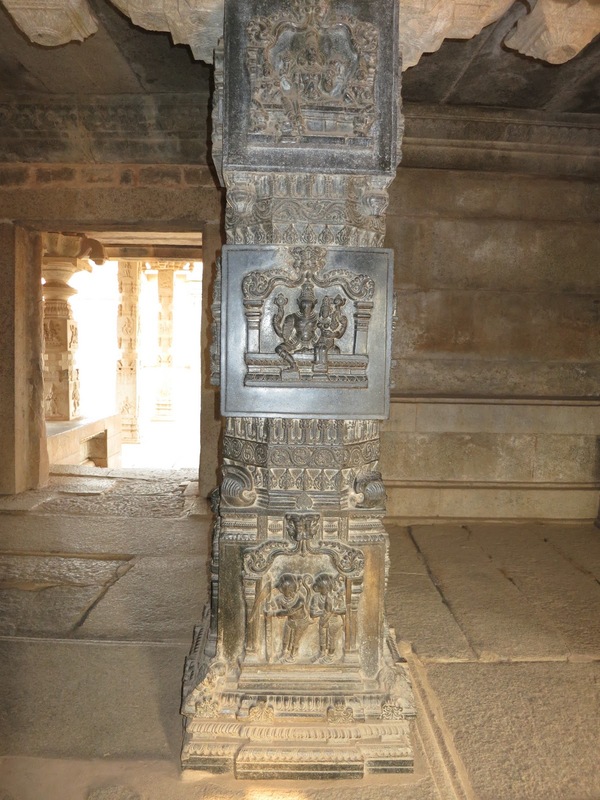 Giant sculptures, temples fully restored, temples in ruins. It all tends to blend into itself, the man-built stone buildings and the giant boulders. There is a beautiful river running through the valley and temples dot the landscape on the hills on the other side of the river from us. I can’t conceive of why they had to build so many temples in one location. There must be over a 100. It must have been amazing when all of the temples were functioning. We walked in the very hot Indian sun for over 4 hours before taking a break. This is one of the sites that has to be visited to be appreciated. At an active temple we saw a wedding. The young couple sat on the floor of the ancient temple as visitors walked by and took their photograph. Everyone was very welcoming and they even gave us rice to throw at the Bride and Groom. It is a Hindu tradition also, I guess. The bride didn’t look too happy. I am sure it was an arranged marriage, and hopefully she will eventually grow to love her husband. 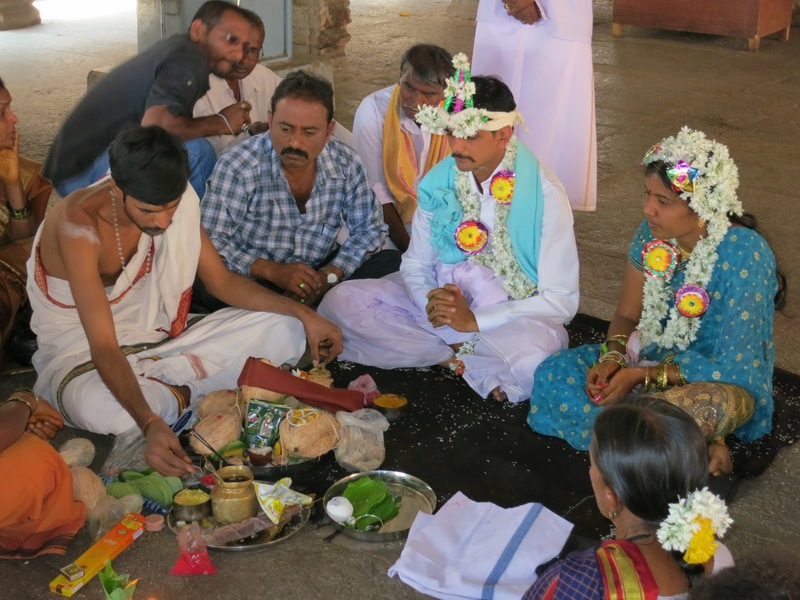 The priest decorated coconuts with oils, ointments and flowers as part of the ceremony. The temple was full of very forward monkeys who tried to steal the coconuts and other wedding paraphernalia. The people continually shooed the monkeys away. We were exhausted from walking around the complex. I doubt that we saw 50% and you could spend a lifetime just becoming an expert in any one of the temples. 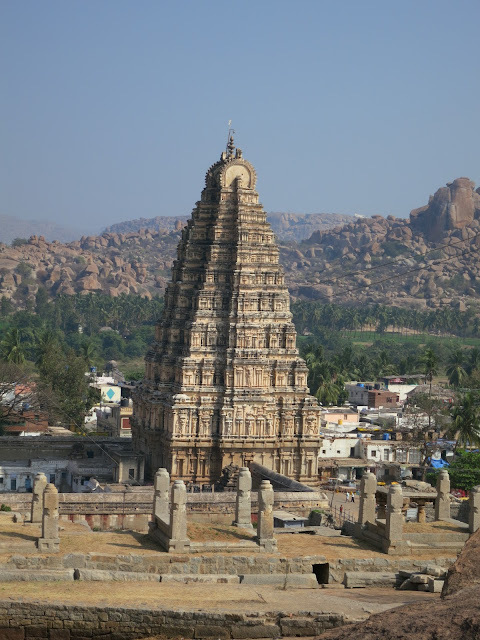 Tomorrow we leave for Badami. Once again I don’t know what to expect, but I am sure it will be great, albeit even more primitive then Hospet. I don’t expect Internet, I would be happy with Air Conditioning and Mosquito control! We are now in the Malaria Zone and there are mosquitoes in the morning and night. We take Malarone pills to hopefully avoid Malaria and use lots of DEEP to ward them off. Wow! you guys sure saw a number of weddings.